Elaine Yuan’s research focuses on how new and emerging forms of communication mediate various social institutions and relations. She has researched extensively on the subjects of network and mobile communication, social media, activism, and social change. Her more recent works examine issues of privacy, community, nationalism, activism, and online market as mediated social practices in China. 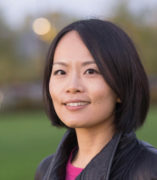 Her critical cultural perspectives are empirically rooted in diverse and innovative research methods such as network analysis and big data approaches. Elaine’s research is international in scope. She is a research affiliate at the Data Mining Lab at the City University of Hong Kong. She was a visiting fellow in the Media and Communications Department at the London School of Economic and Political Science in 2015. Elaine teaches in the areas of culture and communication, new media technology, globalization, and communication theory. Elaine’s work has appeared in many leading journals in the field of communication such as Journal of Communication, New Media & Society, Information, Communication, & Society, Journal of Electronic and Broadcasting Media, Journalism & Mass Communication Quarterly, and Journalism Studies. Her research projects have been supported by the U.S. Social Science Research Council, the U.S. 21st Century Institute, the UIC Institute of Public Civic Engagement, and the UIC Institute for the Humanities.